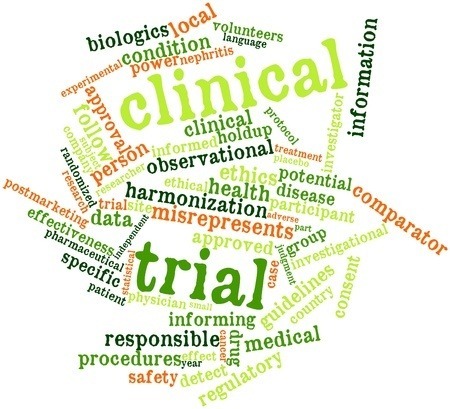 Clinical studies involve research with volunteers to add to medical knowledge. Participating in a trial is a personal decision that requires self-examination and study of the trial itself. These questions were taken from the www.clinicaltrials.gov website to help in discussion with the doctor. I underlined the first sentence because it is so important. state you live in (or states close by). Some trials would involve travel and repeated visits. “actively recruiting” participants (some trials are closed). Most of the trials are testing various medications and combinations of medications. Often some patients will receive the meds being tested while others receive a placebo. Anyone interested in participating in a clinical study should know as much as possible about the study and feel comfortable asking the research team questions about the study, the related procedures, and any expenses. Answers to some of these questions are provided in the informed consent document. Many of the questions are specific to clinical trials, but some also apply to observational studies. 1. What is being studied? 2. Why do researchers believe the intervention being tested might be effective? Why might it not be effective? Has it been tested before? 3. What are the possible interventions that I might receive during the trial? 4. How will it be determined which interventions I receive (for example, by chance)? 5. Who will know which intervention I receive during the trial? Will I know? Will members of the research team know? 6. How do the possible risks, side effects, and benefits of this trial compare with those of my current treatment? 7. What will I have to do? 8. What tests and procedures are involved? 9. How often will I have to visit the hospital or clinic? 10. Will hospitalization be required? 11. How long will the study last? 12. Who will pay for my participation? 13.Will I be reimbursed for other expenses? 14. What type of long-term follow-up care is part of this trial? 15. If I benefit from the intervention, will I be allowed to continue receiving it after the trial ends? 16. Will results of the study be provided to me? 17. Who will oversee my medical care while I am participating in the trial? 18. What are my options if I am injured during the study? In Phase IV studies, after the Food and Drug Administration has approved the drug, continuing studies will determine additional information, such as the drug’s risks, side effects, benefits, and optimal use. Before human testing, usually animal testing is done. The injections we talked about in the earlier blogs underwent clinical trials with volunteers willing to try the drugs to see if they worked. Would you be willing to volunteer in a clinical trial to test a new medicine or treatment to cure or prevent loss of vision?